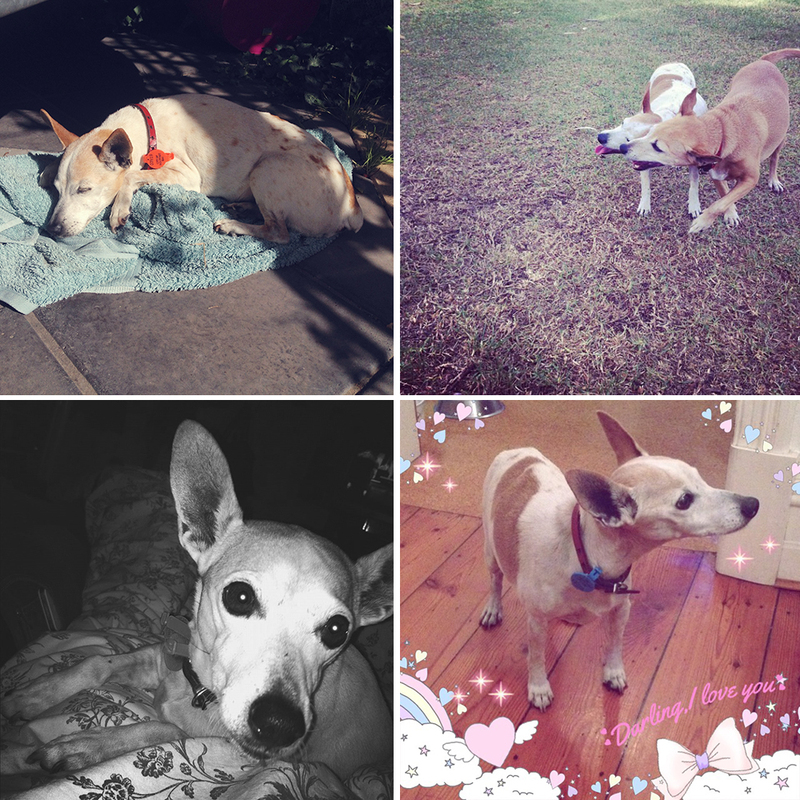 Last week I had to say a very painful goodbye to my old girl Perdy. She'd been sick for a long time, and it came to the point where it was kinder to kiss her goodnight and let her go peacefully, and it's safe to say that I'm nothing short of heartbroken. 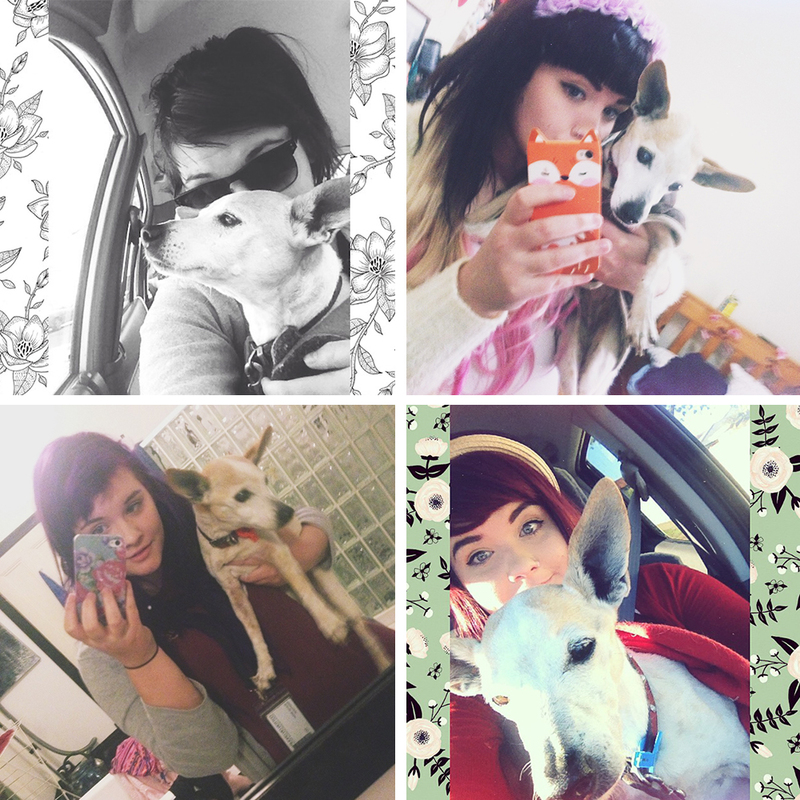 This is my eulogy for my furry baby angel. From about the moment I could talk in coherent sentences I begged my parents for a dog. I was obsessed with 101 Dalmatians, The Fox & The Hound, All Dogs Go To Heaven, and any other canine-centric stories I could get my hands on and I desperately wanted a puppy pal of my own. Perdy (named for Perdita from 101 Dalmatians) joined our family for my birthday and I fell in love with her straight away. I insisted on her sleeping in my room, where she proceeded to poop on my carpet and ended up being moved into a cozy corner in the laundry. She had bright white fur, massive bat-like ears, and a little stump where her tail had been docked too short so that whenever she was happy she would wag her whole backside. 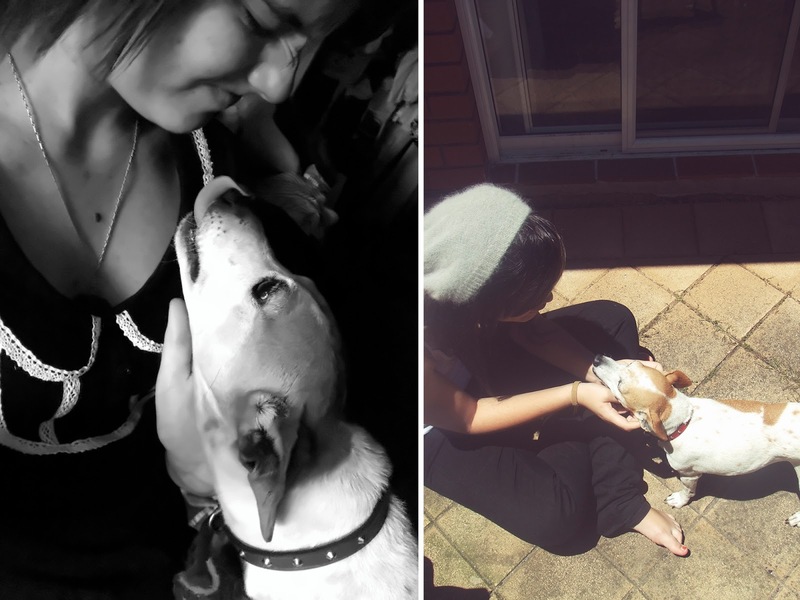 Perdy was a very sweet natured dog, and she quickly became my best mate. She would let me put her in my doll pram and push her around like a baby, she'd let me scoop her up and cradle her and never got snappy when she wriggled out and I accidentally dropped her. Sometimes she even let me try to dress her up, until she got fed up and ran away, shaking off whatever horrible outfit I'd try to put on her as she went. 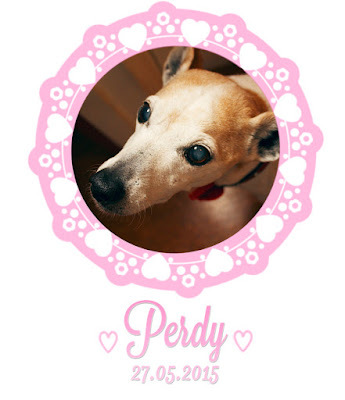 Perdy had so many funny little quirks and mannerisms, like madly licking the air in an attempt to get to your face and smother you with kisses, trying to dig in cushions/carpets/bellybuttons, and running around like a headless chicken when she heard the phrase "where's the rats?!" and she went on the hunt - we never had a rodent problem because she stopped them all from getting anywhere near the house. She was always happy to see us whenever we got home, and often got so excited that she would wet herself when my dad came home from work. She loved to go for walks along the beach, and would always try to start a game of tug-of-war whenever her leash was clipped onto her collar. I even used to make her special doggie 'sundaes' with dog food 'ice cream', biscuits, gravy 'fudge', and a jerky treat stuck in the top as a makeshift wafer - it's not surprising she was a bit of a roly-poly puppy when she was younger! As she got older, she got slower and crankier, but she was still always excited for a good long scratch on the back and the possibility of some food from our dinner plates. She insisted on bossing our other dog Pepper around, and was always very interested in wandering around the house making sure everything was still the same. 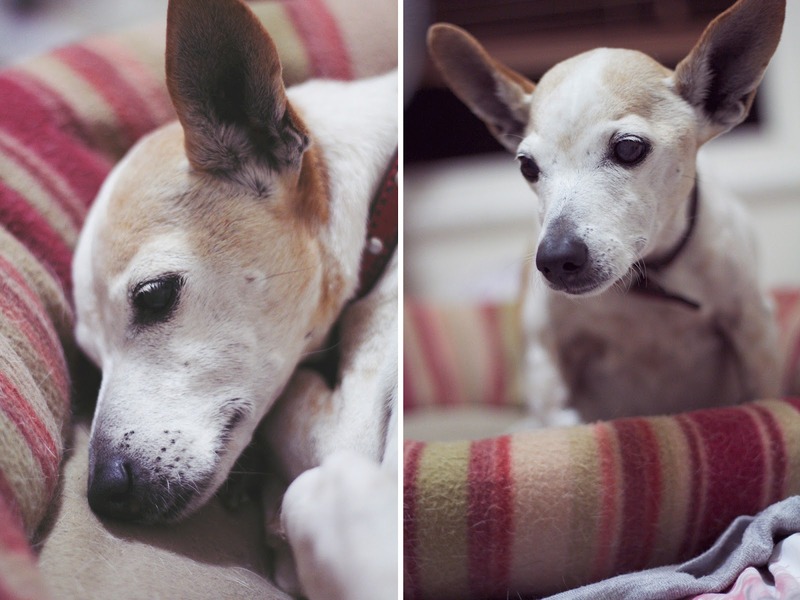 She stopped barking and communicated exclusively in whines that varied in pitch and intensity, but despite her lack of vocals and increasingly neurotic behaviour, she was still very sweet. Her cloudy big brown eyes would stare up at me with intent interest and concentration, and she would always wag her little stump extra hard when I would go out to the dog house to wake her up. 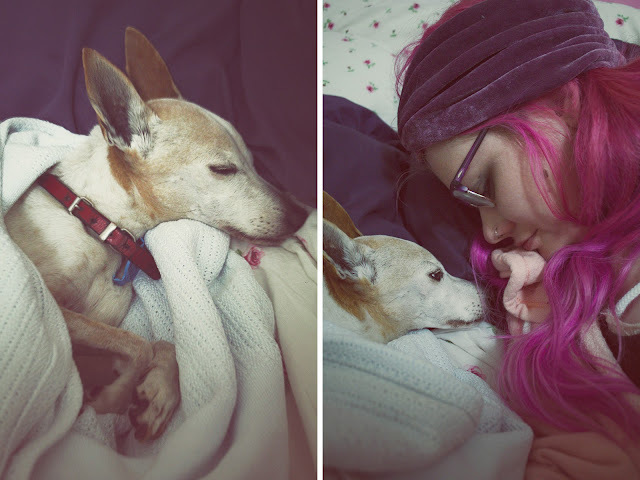 In her later years she wasn't as keen on cuddling, her old bones were tired and she didn't like to be touched too much, but every now and then she would visit me in my room and snuggle on my bed and keep me company. 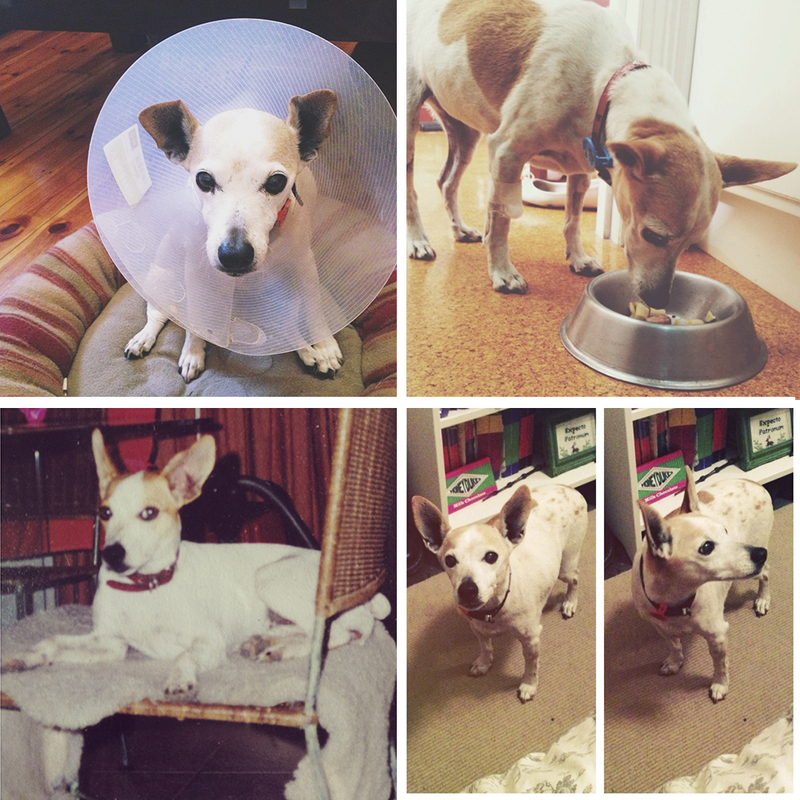 Perdy was my companion for such a long time that I don't think I can even remember my life before she was in it. She would always listen when I cried about how mean the kids at school could be (even if all she was hearing were noises) and let me cry into her fur. We would sit in the yard and I would share my lollies with her when I was seven and on school holidays and I didn't know any better. All of the Jack Russell owners we knew would get together at the local dog racing track and race our pups just for fun, and Perdy would almost always win - she was the fastest Jack Russell in the Northern Territory, the tiniest and mightiest champ. She was always fierce, she bailed up a fully grown rottweiler outside a fish and chip shop when she was barely three months old and sent it crying to its owner after it barked at her, and she stood her ground and pulled through like a prize fighter after she was attacked on a walk by two stray pit bulls which left her massively scarred and a little bit crooked, but all the more endearing. She was tiny, but she was strong in every way a dog could be. We spent our last night together cuddled on my bed. I wrapped her in my baby blanket and told her how incredibly special she was to me, how it was okay for her to leave if that was what she needed, and how dearly I loved her. Perdy taught me so many things during our time together. She taught me love, patience, and responsibility, and while I definitely wasn't the perfect owner (I probably should have bathed and walked her more often) I know that she was so hugely loved, and I know that she felt it. She knew that her time was coming, and when I left home on the day she left me she looked me straight in the eye and for the first time in what seemed like forever I felt as if she was really seeing me, instead of the insides of the cataracts that turned her giant eyes milky. I kissed her head and told her I loved her, and the next thing I heard she was gone. So this is for you, my Perdy girl, you'll be with me forever and I know, that wherever you are, I'm with you too. ;______; oh sweetheart, i'm so so so sorry for your loss!!!! perdy sounds like the kind of dog that anyone would be honored to meet! my cat patches, i had her since i was 3, passed away a few years ago & there are still days when i forget & i think i'll walk into the living room & see her sleeping on her spot on the couch. i was also with my baby when she passed away & i told her that it would be okay for her to go. it was so heartbreaking & i know exactly how you are feeling. but it feels better knowing our pets are not in pain & are healthy & whole - somewhere waiting for us to be reunited again. sending lots and lots of love & hugs your way! !